The spring season has just officially begun, and we already know that this season is the best time for plants and flowers to grow because of the sufficient amount of moisture in the air as well as the ideal temperature of the weather. But with these plants there comes some unwanted weeds that ruin the beauty of a lawn. There are other factors that must be considered when taking care of your lawn which will be further discussed below. You may also see printable business cards. While landscaping and lawn care can be done on your own, you can also hire professionals to do it for you. These professionals are capable of doing more than just mowing and watering the lawn, they are actually capable of doing other tasks since they were trained to understand the land area and the concept of spatial awareness. These professionals are called landscapers. 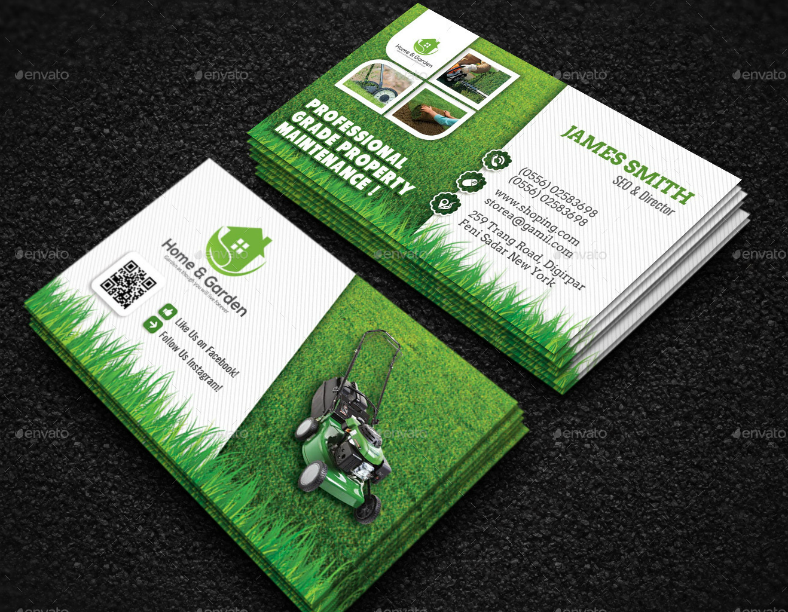 Just like other professionals, landscapers need to make use of cool business cards to make themselves known and to share their contact details with others. 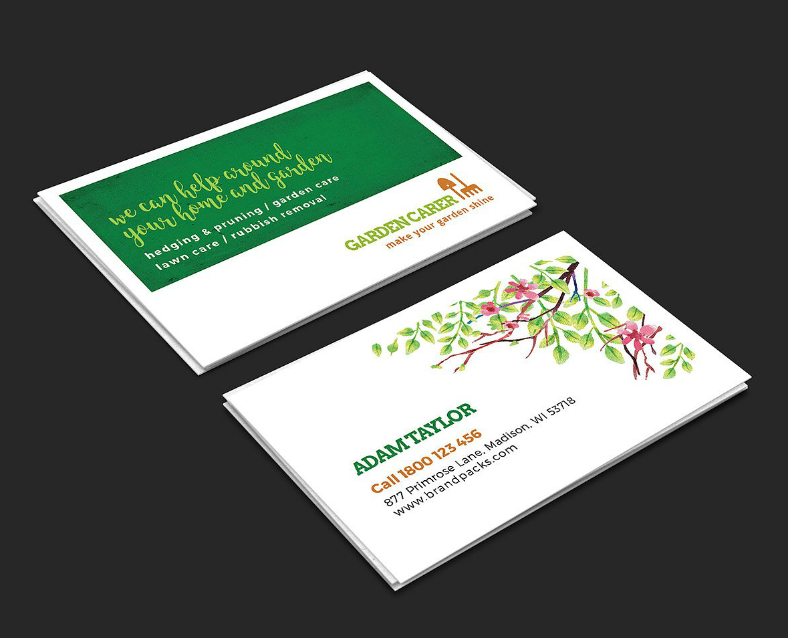 If you are a landscaper and you need to make your own business cards, we have an entire collection of landscaper business card design templates below that you can download, scroll down to see them yourself. Check out the awesome-looking modern business card template above which you can use to share details about yourself and what you do. Both sides of the card are being used for this template, with one side showing an image of a lawnmower. The other side of the card is where the details of the cardholder are being indicated along with some thumbnail images of the different services offered by the cardholder. 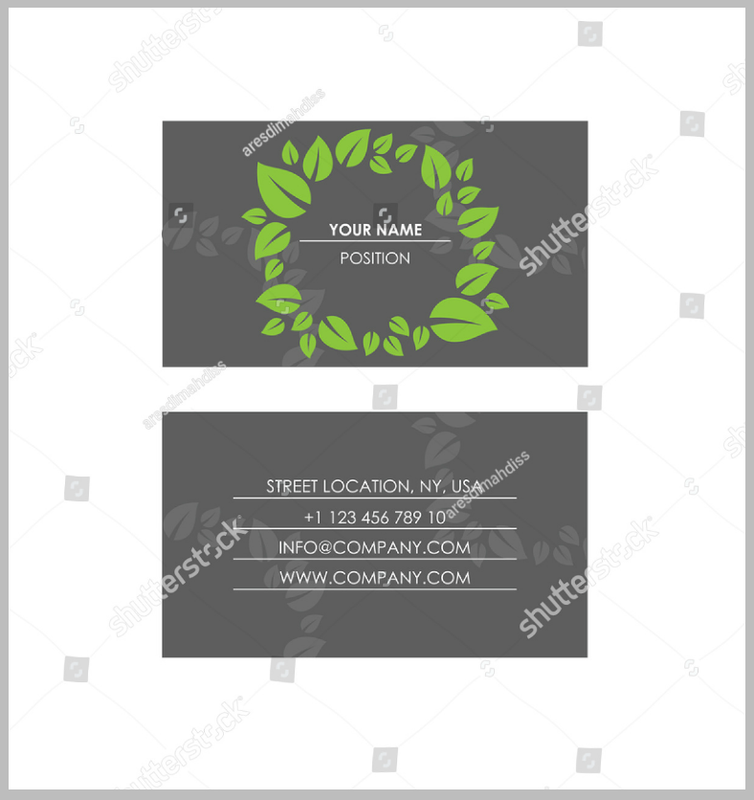 Above is a clean landscaping business card design template that you might like if you prefer a more simplistic look for your business cards. 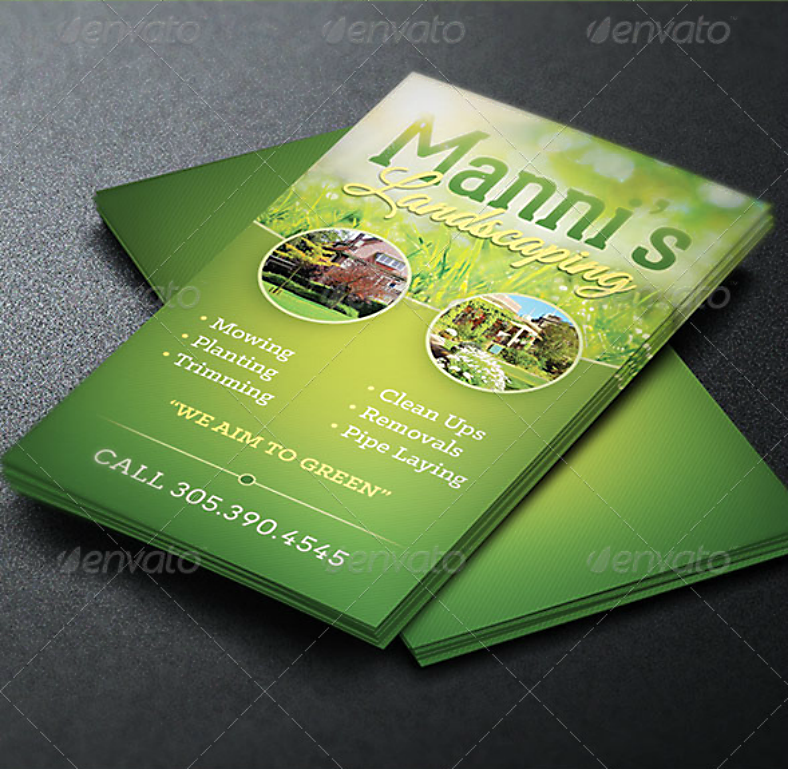 This template prominently uses the green color which is appropriate considering that landscapers handle plant and lawn maintenance. In addition, the heavy use of white space on this template further enhances the appearance of this glossy business card. Do you want your folded business card to stand out? A good way to do that is to use an unconventionally-shaped business card. The template above uses a portrait orientation and has been specifically made to be printed on a tall card stock. Above is another business card example that uses a portrait orientation which you might also be interested in. Just like the previous template, this one maximizes its use of white space. But the different between this and the previous template is that this one uses flat, abstract illustrations which makes the entire design simpler, more straightforward, and easier on the eyes. What is a Business Card and Why are They Important? A business card is a card that bears personal information of a businessperson, or the business information of an industry. The information that a business card holds would usually include the name of the company or the individual, their designation, their personal or office address, and their contact details—though some business cards would include more than just those details. Business cards are usually printed on a small card stock—usually 3.5 inches by 2 inches in size—and covered with a layer of UV glossy coat to protect the printed surface from any damages resulting from ultraviolet radiation. Some business cards are printed on both sides, with each side used for corresponding purposes such as additional details or for multiple languages. Business cards are commonly exchanged between two businesspersons to share each other’s contact details which can probably lead to a partnership in the future, or it can also be one-sided and only given by the businessperson to a prospective client. And while exchanging information can be done through other means, exchanging free business cards is the most formal way to do it. What are the Types of Business Cards? 1. Company Card. A company business card is commonly used by company owners to share details of their business to other companies or to prospects. But aside from just company owners, a company business card can also be used by its employees who wish to spread the name of their employer for recognition purposes. 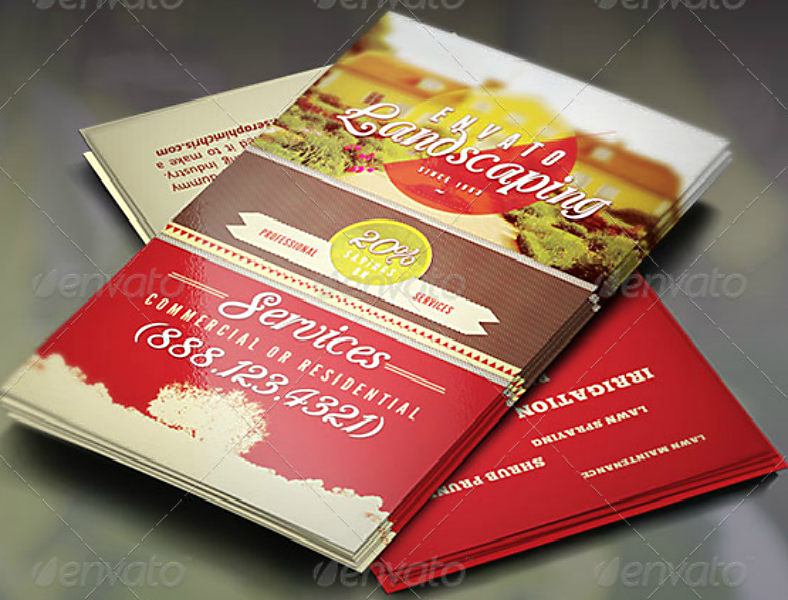 You may also see best business card templates. 2. Personal Brand. This type of luxury business card is used by individual professionals regardless if they are committed or working for an employer. This way, the professional won’t need to worry about changing business cards when they transfer from company to another. But the most common people who use this type of business card are freelance professionals. 3. Creative Type. A type of business card that is described as experimental and involves a lot of artistic features. The creative type of business cards are commonly used by fashion designers, graphic artists, and other professions that are more on the creative field. 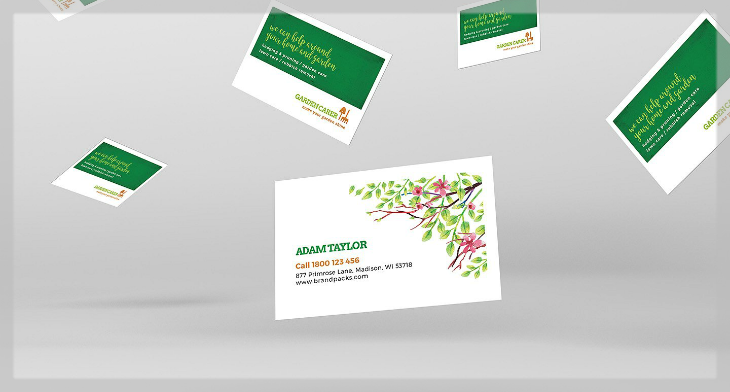 Business cards that fall under this type usually incorporate the creativity or uniqueness either on the design itself or on the shape of the card stock. You may also see black business cards. 4. Multilingual Card. Otherwise known as a globe-trotter, this type of business card is one that is used by professionals who do a lot of traveling to different countries. These business cards are printed on both sides with the same information but with different languages. The reason for this is to allow these professionals to operate in different countries and to find a solution to language barriers. What are the Parts of a Business Card? 1. Company or Personal Logo. The first and probably the most prominent element on a business card is the logo which represents the cardholder. 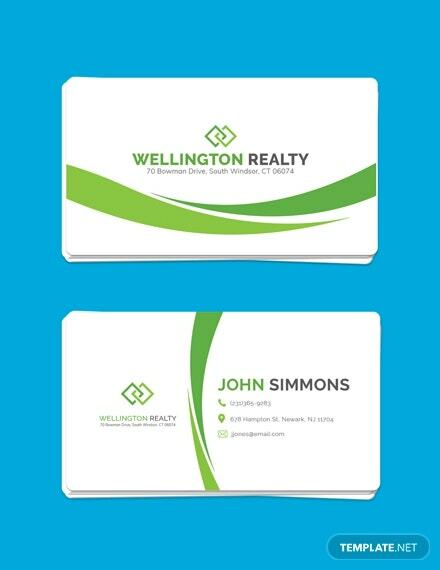 Some business cards would feature the logo alongside the other details on one side of the card, but others would also have it on a separate side to maximize the use of the card stock. 2. Name of the Individual or Company. Next to the logo is the name of the cardholder, which could either be the company or an individual. If the cardholder is an individual, their job title will be indicated right below their name. However, if the card is used to represent a company, the space below the name can be used either to indicate the nature of the company or to write a short tagline. You may also see business card mockups. 3. Street Address. An element of a business card which is only necessary for companies that have an actual physical location. This is a necessary part of a business card if ever the prospective client or business partner wish to send a mail or desires to visit the office of the cardholder. But for companies that are online-based, adding a street address on the business card can be omitted. 4. Telephone Numbers. One of the most important details on the business card, which can also be considered as the call-to-action feature. If the cardholder has multiple telephone numbers and wish to include all of it on the card, the most direct line should be indicated first and followed by the other contact numbers. For easy readability, you may list down the contact numbers vertically, but if you choose to enumerate them horizontally, you should separate them with either hyphens, semi-colons, or periods. You may also see business card examples. 5. Email Address or URL. Whether or not your business has its own physical location, the inclusion of an email address is very important, especially in today’s modern generation. And with URLs, it can either be the official website of the company or it can also be a page on a social media website. 6. QR Codes. In addition to the previous bullet point, QR codes have become more and more relevant over the previous months, and can be used for redirecting to the company’s website or social media page. As opposed to using the URL to manually input the address onto a browser, you can simply scan the QR code using your mobile device’s camera app or a third-party scanner. 1. Always remember that first impressions last, not only towards your business card but also towards the company, in general. So think of it this way, an organized and presentable business card will give the impression that your company is sincere and professional. 2. There is actually an exception to the last bullet point, and this is with regards to making your business card’s theme reflect the nature of your company. This means that if the company leans more towards being fun and creative, they may be allowed to use a more playful and unconventional theme for their creative business card. 3. 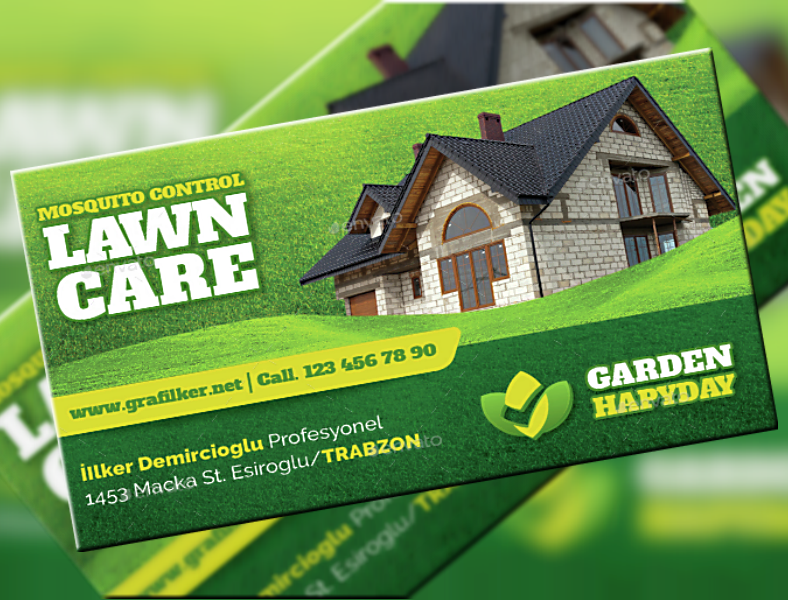 In relation to the previous bullet point, it is also recommended that the business card’s design is able to provide prospects with an idea with regards to their products or services.. Let’s use as an example the templates that we have on this article, which are landscaping business cards meant to be used by landscapers. From simply looking at the elements on the business card, prospects can right away determine what this company is about. 4. Also, when using a theme for your business card, make sure to be consistent and use that same theme for your website and for the rest of your marketing tools. This consistency is specifically for identification purposes. 5. Organize your contact details accordingly to make it easier for the reader to go through, and you can follow the sequence of details indicated above on the “parts of a business card” section. You may also see PSD business card designs. 6. Proofread your content before giving away copies of your modern business card, or you may even do before your start printing out your business cards. When proofreading, check for any spelling and grammar errors, and also see to it the the information that you have written down are correct to avoid misleading your prospects. Above is a simple yet elegant business card template that you might like if you are looking for something that is quite extravagant. One side of this template contains all the necessary details about the landscaper written over a solid black background. 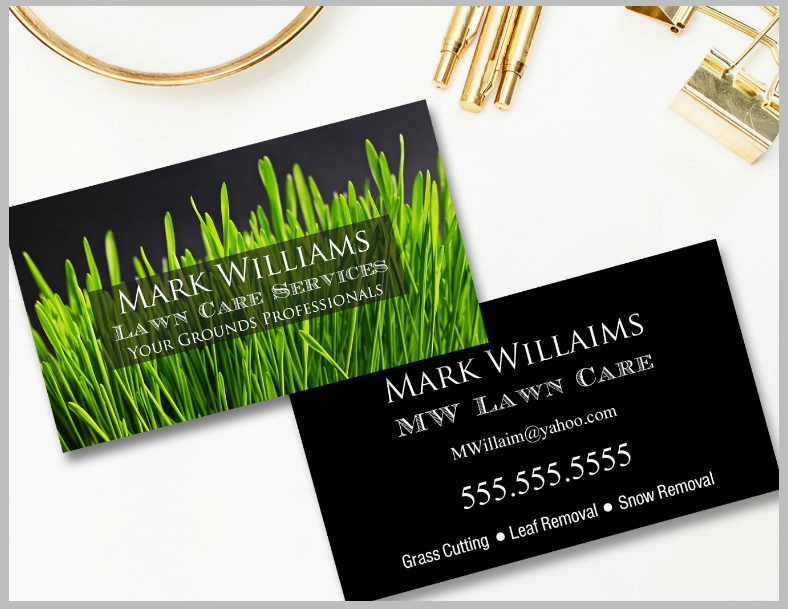 The opposite side of the card bears the name of the landscaper along with their job title, and on its background is an up close image of some healthy, green grass. If you embrace minimalism and you wish to incorporate that on your business card’s design, then you may be interested in the minimalist business card template above. 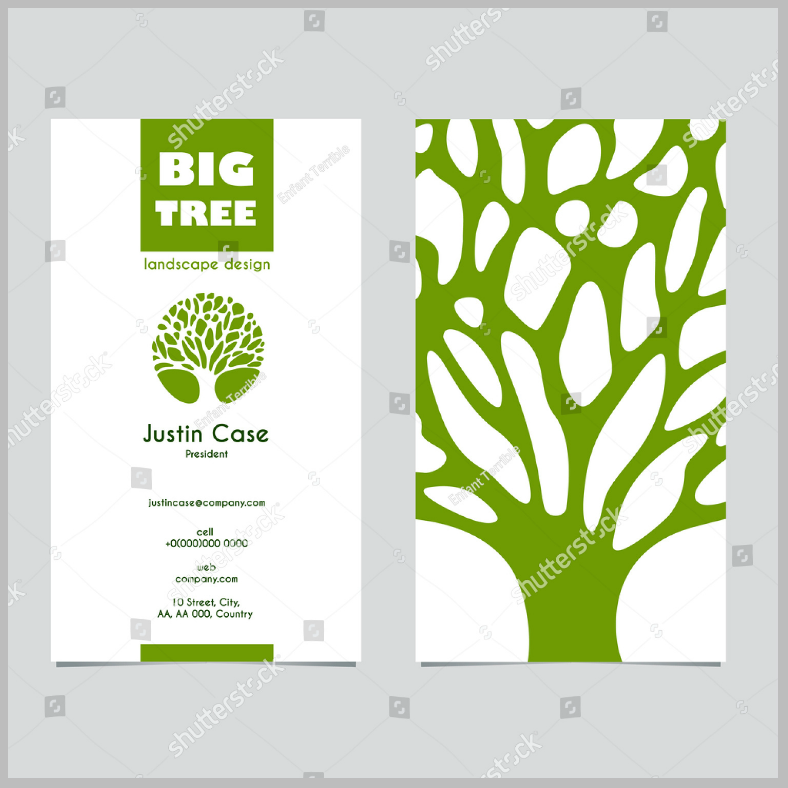 One side of the card stock is printed with a flat image of a lone tree with the business’ logo design. The other side of the card is divided into two halves, with the left half bearing the logo of the business and the right half containing the contact details of the cardholder. Do you want to add an inspirational quote on your business card? You may be able to do that with the business card template above. 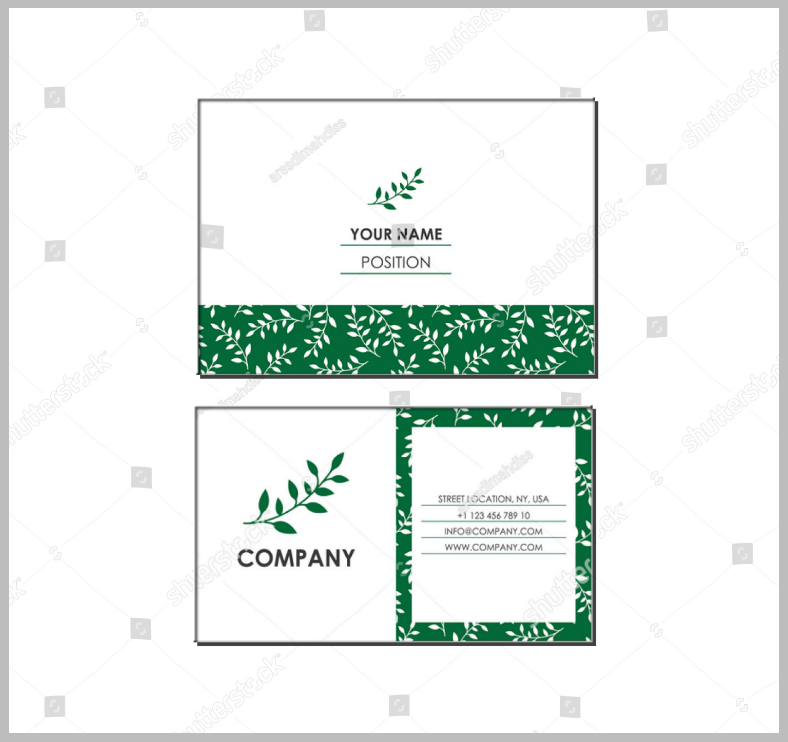 One side of this template is intended for the name and the business details of the cardholder, and the other side is intended for the nature-related proverb written over a solid green background. By definition, landscaping refers to the art of beautifying or modifying the area of land which is visible by the public. Landscaping activities include the arrangement of plants, rocks, and bodies of water, while also taking into consideration the terrain shape and elevation, and even the weather and lighting conditions. You may also see business card designs. Landscaping requires extensive study and understandingthe of land, though this understanding varies according to different countries or cultures. Because of these variations, it is best that a landscaper takes into consideration the preferences of the land owner. You may also like transparent business cards. Even though the goal of landscaping is to enhance the appearanceaa of visible land area, there are also times that a particle area of land is no longer fit for landscaping. For a case like this, the land area may need to be reshaped before they can be landscaped, and the reshaping of land is referred to as grading. You may also see unique business card designs. 1. We are already aware that landscaping can aid in making the visible area clean, but it can also help in maintaining cleanliness and promoting a healthy environment naturally by capturing pollutants and producing oxygen. You may also see cleaning business cards. 2. A well-landscaped land area can help act as a natural coolant as well as provide a sufficient amount of shade to a property. It has been proven that landscaped areas have a cooler temperature than those that are surrounded purely by concrete or soil. You may also see free business card samples. 3. Landscaped areas can also help in absorbing unhealthy water runoffs. In cases of heavy rains, plants can be very useful in reducing the risk of floods. Aside from that grasses and soil can also act as natural water filters. You may also see medical business cards. 4. According to the science of colors, green the color used to symbolize life, nature, growth, energy, and harmony. Because of this, it is best to keep the environment as green as possible to promote positivity and relief from stress. 5. If you are planning on selling your property, proper landscaping can make your home highly attractive to prospective buyers and it can also increase your home’s value in the market. You may also see round business card templates. 1. Try to keep unwanted weeds from growing or from even germinating in the soil by using a herbicide that works specifically for eliminating digitaria and other hard-to-kill weeds. You may also like music business cards. 2. Get rid of broadleaf weeds as soon as they sprout. If there are only a few of them, you can do it by hand. However, if a lot of them have already grown, then you can treat it using a granular weed control product. You may also see cheap business cards. 3. Try to keep your mower blade as sharp as necessary before starting to mow you lawn. A dull mower blade will result in uneven shreds, wherein some grasses will be torn off the soil instead of being cut. This will lead to making your lawn appear grayish brown, and will also make your lawn more susceptible to diseases. You may also see grunge business card templates. 4. The best time to water your lawn is early in the morning, since the sun can help dry the grass and soil as the day progresses. Watering your lawn at night will make the grass highly susceptible to diseases because of the prolonged moisture. And when watering your lawn, make sure to really soak up the soil so that the roots can get moisturized as well. You may also see funny business cards. 5. Do not apply too much fertilizer on your lawn, it is all about balance when maintaining a healthy lawn. Too much fertilizer can be unhealthy to plants and can potentially burn your grass from too much chemicals. Refer to the instructions provided on the fertilizer’s packaging, or you can also ask advice from experts. You may also see orange business cards. If you wish to include multiple contact details on your business card but don’t want it to end up looking cluttered, the template above would be the perfect choice. 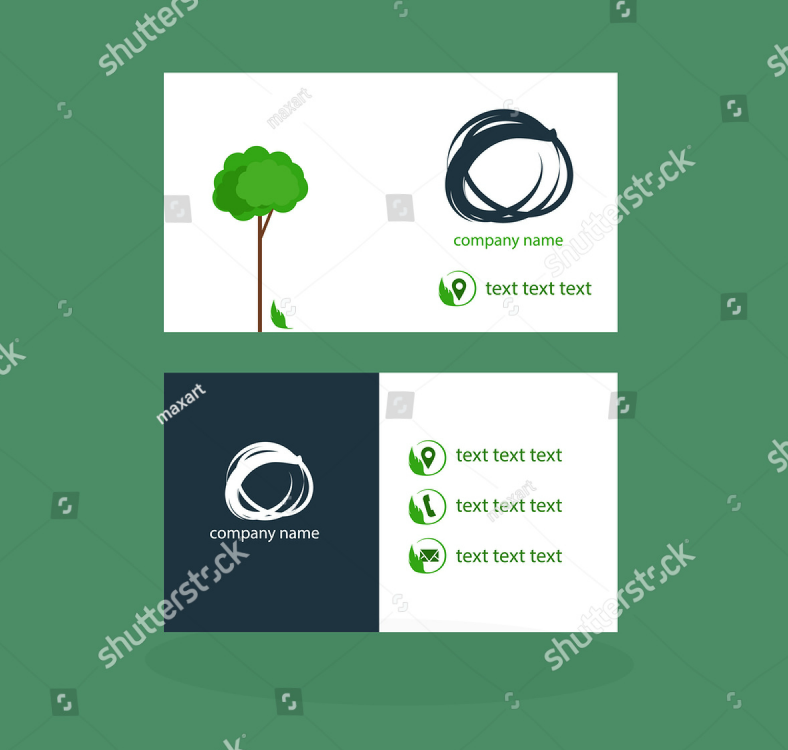 For this blank business card template, the back side contains various color-coded text boxes with each text box intended for a specific information. Do you like silhouette images? 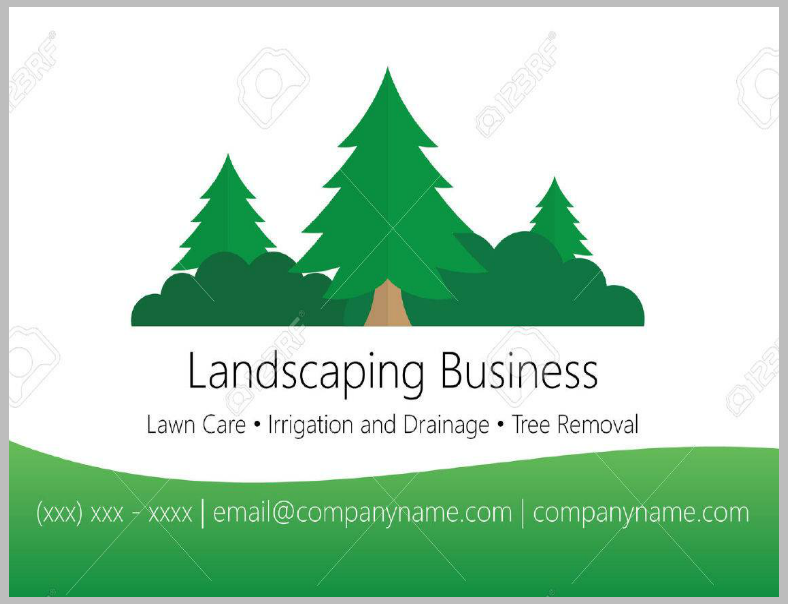 Because if you do, the business card template above contains just that to represent a landscaper and landscaping in general. 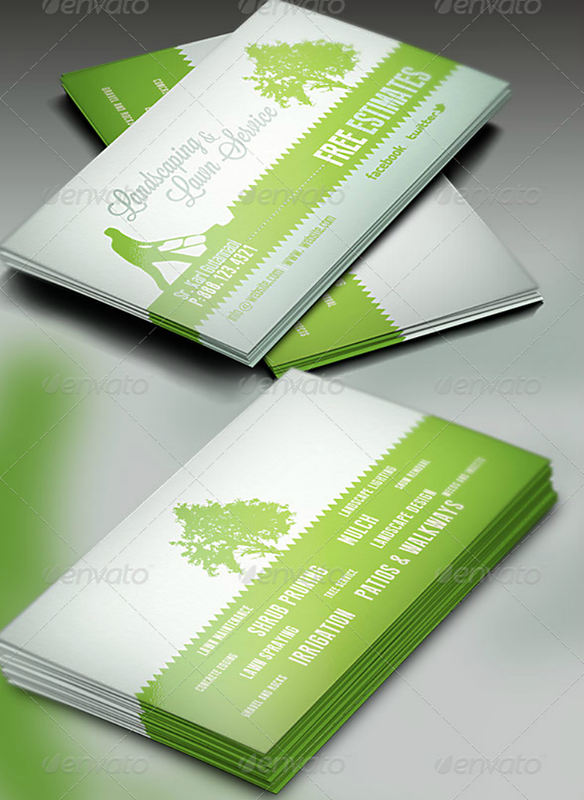 One side of the business card bears a silhouette image of a tree, and the other side shows a silhouette of a tree and a gardener. 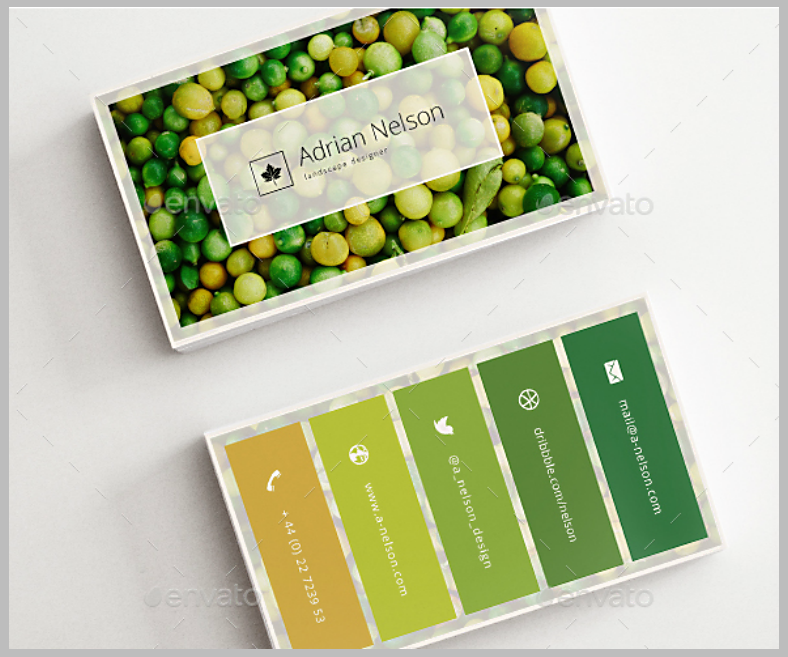 Check out the flat and simple business card template above that you can use for your business. The symbol in the middle area of this card bears a flat illustration of some trees and bushes. 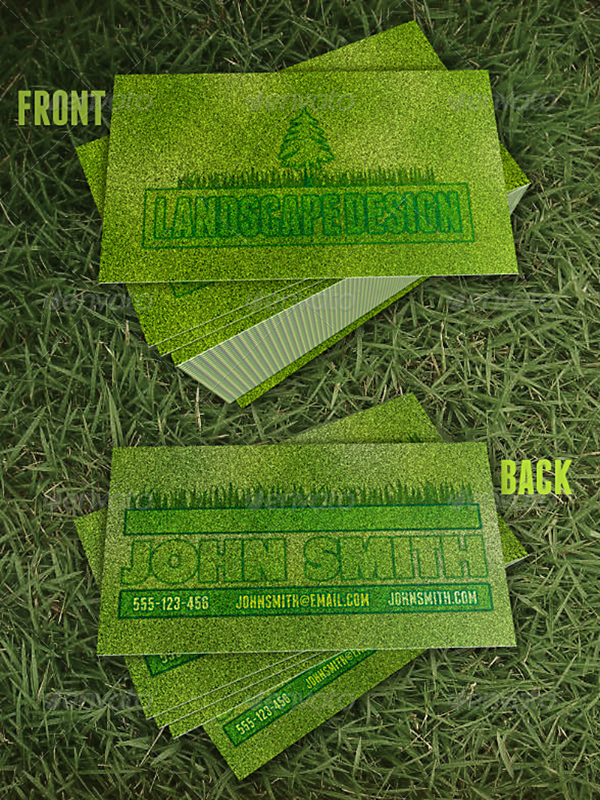 This may also be a good template to use if you prefer a cleaner look for your landscaping business cards. Do you think you are competent enough for this kind of business? If so, then your business card should also be able to stand out from the ones used by your competitors. Thankfully, the cool business card templates that you have just seen are very creative, we actually selected them from among hundreds of the best ones all over the internet. Let’s also give credit to some of the best graphic artists from all over the world for providing us with their wonderful creations. But, there is actually more to these templates than just being pretty. Of course, when downloading pre-designed templates from the internet, you will definitely need to customize them first before you can actually use them. Thankfully, these templates are highly editable and you can modify the design as much as you need without having to worry about jeopardizing the quality of the template. The reason behind that lies in the format used for these templates, which are capable of actually preserving their sharpness regardless of how much changes have been made. You may also see business card samples. Now that we got those covered, we are left with one more concern, which is with regards to the amount that you will need to spend to download these creative business card templates. While other websites offer their high-end templates for a price, the ones here on our website are reasonably priced to make them conveniently accessible. So, why do you need to look for templates someplace else when we already have what you need right here? If you’re all set, then click on that download button now.